Once a month we’re featuring a new family-friendly dish from the Hatfields for our Kids Can Cook section. The dairy-free teen cooking star is Katherine and this week she and her mom, Sarah, have made a Banana Split Icebox Cake. It’s modeled after the basic Dairy-Free Icebox Cake Recipe we shared for the 4th of July, and Sarah has the pictures and details for us. Katherine and I really enjoyed the red white and blueberry icebox cake we made for Independence Day and wanted to create another fun flavor. 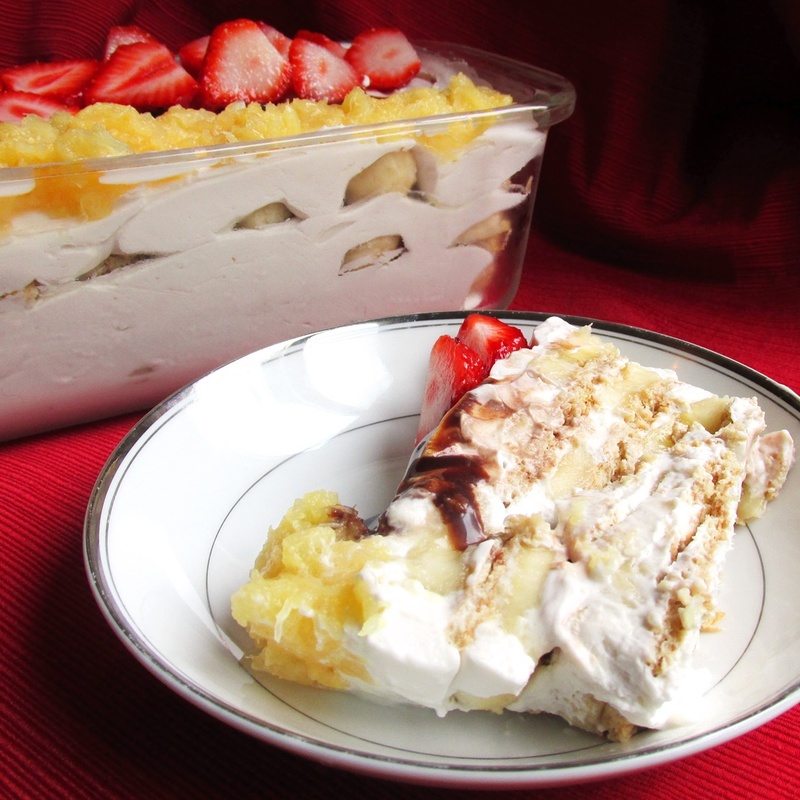 Alisa suggested a banana split icebox cake, which was a huge hit. Of course the kids enjoyed every sweet bite, but this cake also fills the banana pudding void for my husband Scott. He’s been on the hunt for a delicious dairy-free banana pudding, but his favorite pudding recipes and vanilla wafers are made with dairy-full ingredients. 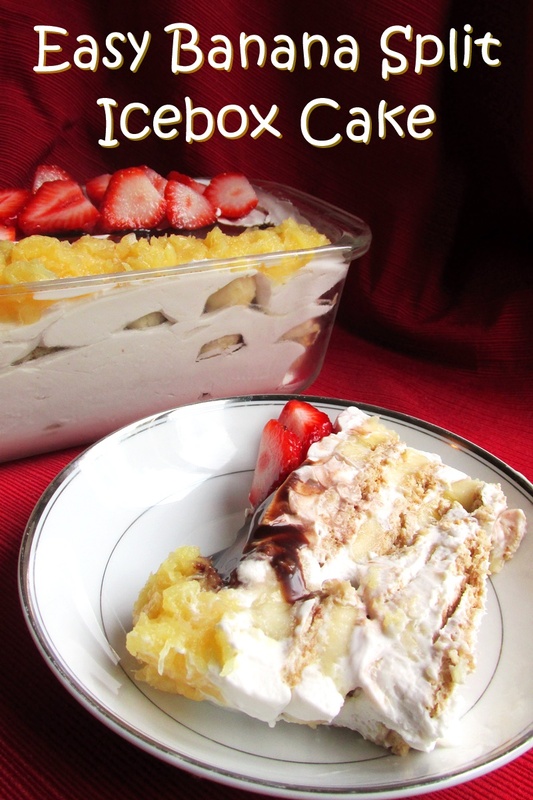 Not only does this banana split icebox cake fulfill his cravings, it’s also so easy and fun to make with the kids! The whipping of the coconut cream can be a little too delicate for very young cooks, but the graham crackers, fruits, and toppings are fun for anyone to help with. Bananas are soft enough to slice with a table knife, making them a great first cutting job for young sous chefs. 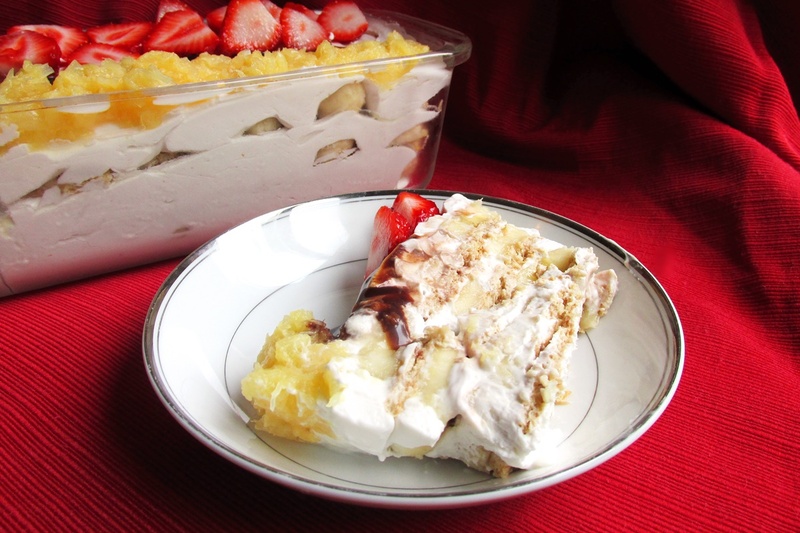 Katherine is a young teen, and able to make this banana split icebox cake from start to finish. 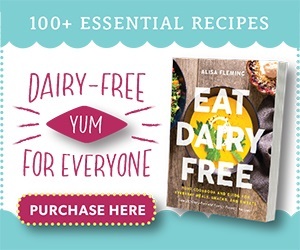 She and I are hooked on Alisa’s coconut cream recipe and are on the lookout for more ways to use it! For a gluten free dairy free banana split icebox cake, be sure to source grahams like Kinnikinnick’s S’moreables or Pamela’s Graham Crackers. For a strictly vegan banana split icebox cake, it’s important to know that most graham crackers do contain a touch of honey. Nevertheless, there are a few rogue honey-free brands out there. As another option, you can swap in your favorite crunchy strictly vegan cookies. 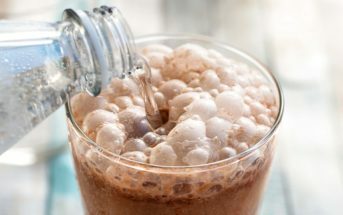 Dairy-free chocolate sauce options – Believe it or not, Hershey’s is dairy-free, but the ingredients aren’t the most appealing. We like Ah!Laska, Emmy’s, or Jen’s Zen for store-bought. For homemade, try my 3-ingredient healthy Chocolate Drizzle or this much more indulgent Hot Fudge Sauce. Please note that you will want to place your coconut milk in the refrigerator before preparation (at least several hours) and that our Prep time doesn't include chilling. 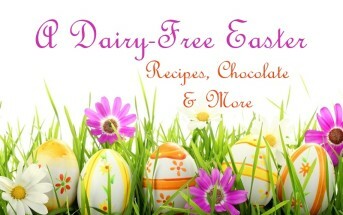 The dairy free whipped cream in this recipe is adapted from Go Dairy Free: The Guide and Cookbook by Alisa Fleming. Spread a thin layer of the whipped coconut cream in the bottom of a glass loaf pan (8.5x4.5-inch used here). Then cover with a layer of graham crackers, using smaller rectangles to fill in the edges as needed. 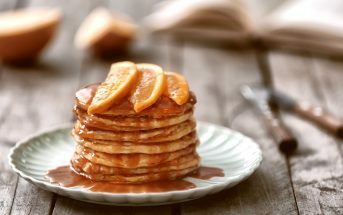 Top with a single layer of banana slices. Repeat these layers until the pan is full, ending with a layer of coconut cream. Before serving, top the cake lengthwise with a row of strawberries on one side. Spread the crushed pineapple on the other side. Drizzle the chocolate syrup in the middle. Slice into squares and serve. Refrigerate any leftovers; they will keep for a couple of days. This was truly amazing! Loved it!! Fantastic! Thanks for your feedback Kimberly. 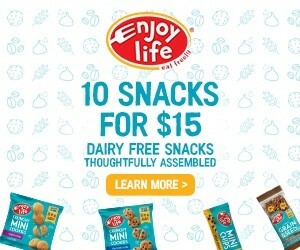 Our son is allergic to wheat, dairy, eggs, peanuts, sesame, and coconut. Is there any way to make this without the coconut so that it could be safe for him? 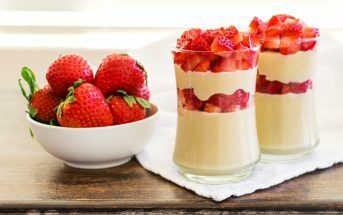 Hi Jennifer, I don’t have any solid suggestions for you at this time, but if you are able to make a “safe” pudding (not sure if Jell-O is safe or if you have a reliable homemade recipe) then you can use it for the creamy layer instead. Not quite the same, but still tasty! How do you skim the cream off the top of the so delicious coconut package since it has a pour spout? Last time I bought it, I found it hard to get the cream out of the container once it was refrigerated overnight. I could squeeze some out but couldn’t scoop it out like you do with a can. And the liquid ended up mixing in with the cream in the process. Any tips? Hi April, with those packages, I often empty them into a small container when at room temperature, cover and put that in the refrigerator to chill. This sounds like a delicious and light dessert. I am tempted on layering sliced strawberries with the banana annd Graham crackers. Is there a reason I shouldn’t? I’m not sure if it would become watery. What do you think? 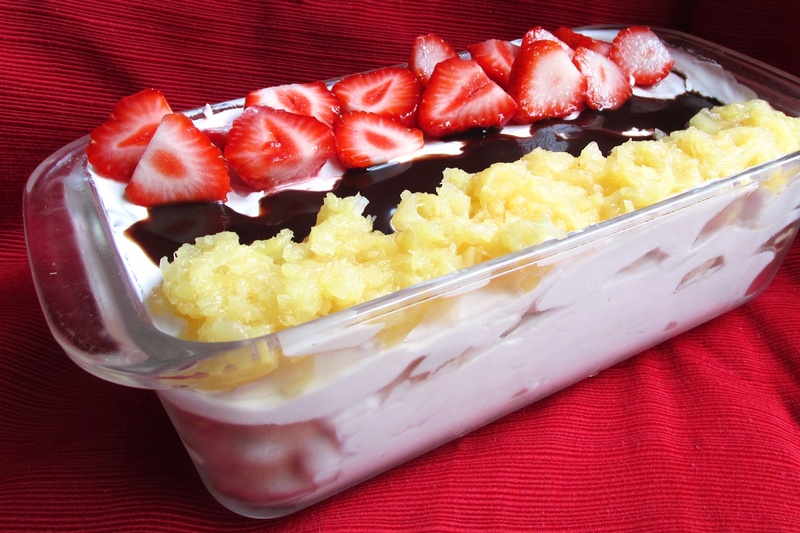 What a cool dessert for making with pre-teen and teens! I love the idea of using lots of fruit in a dessert, especially one that is so kid-friendly.